Anna and Paul purchased their 1960’s detached house in Cheam which they wanted to renovate and modernise to create their family home. This architecturally designed house has been modernised in the past, with large open rooms, large glazing and a modern feel of its time. The house has a striking steep pitched roof to the rear facade. The general form and style of the house was unique, however, the house required updating to meet modern living. The aim of the design for the ground floor was to create a large open-plan kitchen, dining and family space that leads out onto the rear garden. We designed a single storey infill extension and reconfigured the internal walls in order to achieve the open plan space. One of the main challenges that we faced was to ensure the design of the new extension matched that of the original form. We achieved this by a continuation of the existing roof design and incorporating matching tiles. A mixture of full height sliding doors and fixed windows were used in the design to maximise natural daylight. Another key aspect of the design was the conversion of the existing loft space. The property already benefited from a large internal ridge height and the main roof had an extremely steep slope to the rear, therefore the addition of dormer windows were not required. The dormers would also distract from the original style and appearance,instead large rooflights were added into the roof to allow natural daylight and ventilation. The house was completly renovated and decorated throughout, including new windows, doors and updated services. 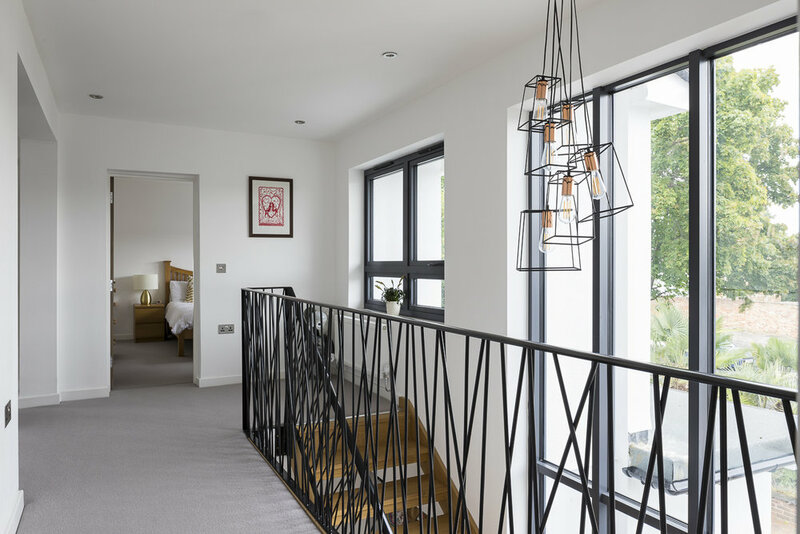 One of the key design features of the house is the entrance, hallway and landings leading to the upper floors. When the house was designed in the late 1960’s it was designed with full height windows to the front that followed the staircase from ground to the first floor. The original staircase was beautifully crafted in timber with open treads and balustrade in a dark mahogany. This allowed natural light to flood in from full height glazing from the front. Unfortunately due to the changes in regulations the staircase would not meet current standards and with a young family it was decided to alter the staircase. The new design was inspired by the original staircase keeping the feeling of openness and maximising natural light. The new staircase is made from solid oak with open treads in an “L-Shape” form. 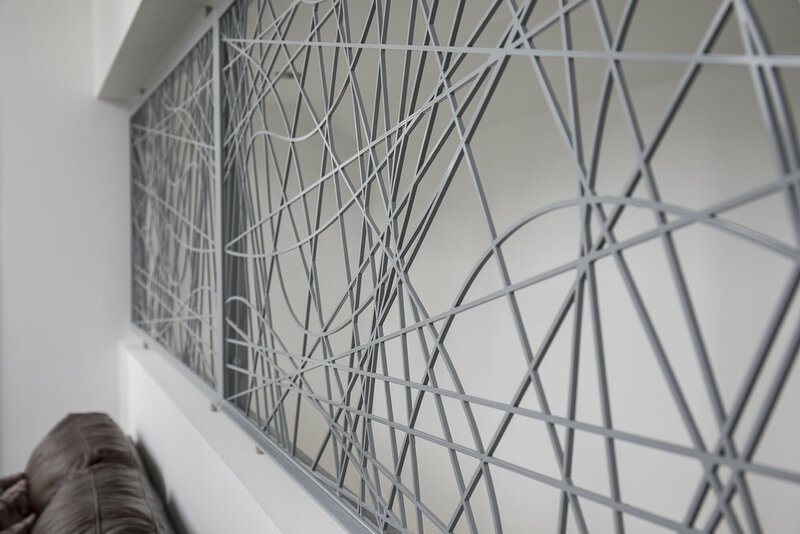 Anna and Paul engaged with Fox Design Studio to manufacture and install an open lattice work of black metal rods crisscrossing to create the balustrade, with a matching black hand rail. This stunning, modern, pivotal feature of the design runs from the ground floor through to the top floor. Planning was achieved through the properties Permitted Developments Rights and the application to the Local Authority was a Certificate of Lawfulness. As the property is not located in a conservation area and is not listed, its permitted development rights have not been reduced or removed.